Inspired by a similar initiative in southern Africa, the Nordic governments endorsed the creation of the Nordic Women Mediators (NWM) network at the Nordic African Foreign Ministers' meeting in April 2015. The NWM was officially launched​ in Oslo on 27 November 2015, followed by an international launch in May 2016 at the United Nations in New York. ​​​The PRIO GPS Centre is an operational partner of the NWM in Norway, together with NOREF Norwegian Centre for Conflict Resolution. Photo: The NWM network at the Reykjavík Annual Meeting in May 2017. Follow the network in social media on #WomenMediators. 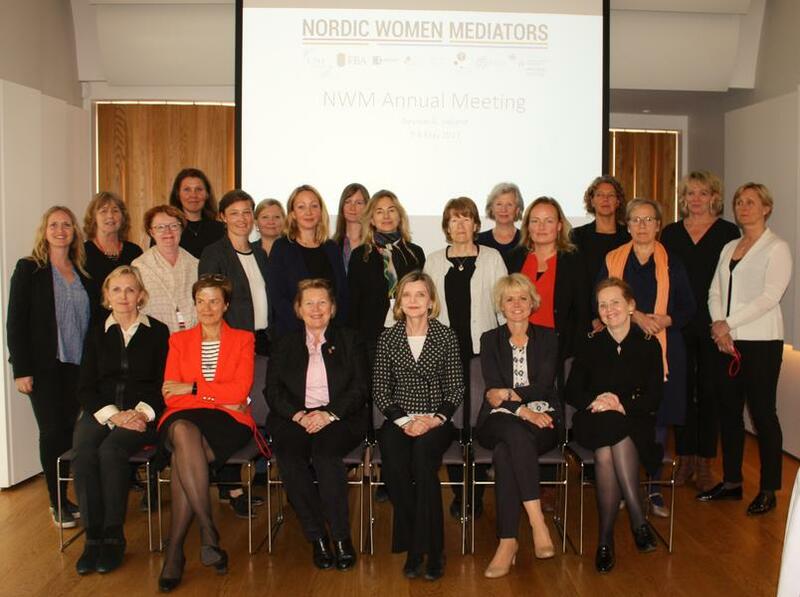 The NWM-Norway network is part of the Nordic Women Mediators (NWM). The mission of the Norwegian network is to enable women mediators’ and peacebuilders’ inclusion and meaningful participation in all phases of peace and dialogue processes to achieve sustainable peace. NWM-Norway is a diverse national network of some 40 professional women with different backgrounds and expertise in mediation from diplomats and lawyers to military and police officers to communications and logistics specialists. Members have either direct experience on mediation teams or directly supporting negotiations. The membership's diversity is also reflected in terms of their language competence, where they are in their careers and which processes they have been involved in. Members are currently involved in a variety of processes including in the Philippines, Colombia, Syria and Iraq, as well as having experience from past processes in Nepal, Afghanistan, Sri Lanka, Sudan and Israel-Palestine. Prospective members of the Nordic Women Mediators-Norway can send a short application, with attached cv, to the contact persons below. Each application is considered by the steering group of the NWM-N, at the monthly steering group meetings. Successful applicants have experience related to peace mediation or other relevant areas of peace processes, such as transitional justice, security sector, ceasefires, gender, etc.